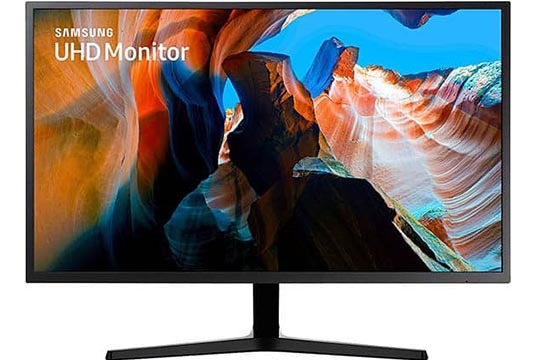 The Samsung U32J590 is a good yet cheap 4K monitor for console gaming, casual PC gaming, watching movies, web surfing, and any other multimedia use. Here’s what you need to know about it. 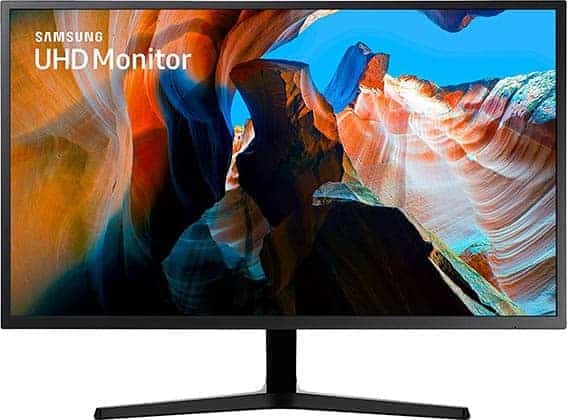 Although Samsung advertises this monitor as ‘QLED‘ meaning that it has quantum dots, the VA panel of the Samsung UJ590 covers only the basic 99% of the sRGB color gamut and has a static contrast ratio of 3,000:1. QLED displays, on the other hand, have an extended color gamut of 125% sRGB coverage as well as a higher contrast ratio. However, they also cost more whereas the Samsung U32J590 is available for a very budget-friendly price – considering it’s a 32″ 4K monitor. So, Samsung either put QLED by mistake on the monitor’s product page or its quantum dots don’t do anything at all. 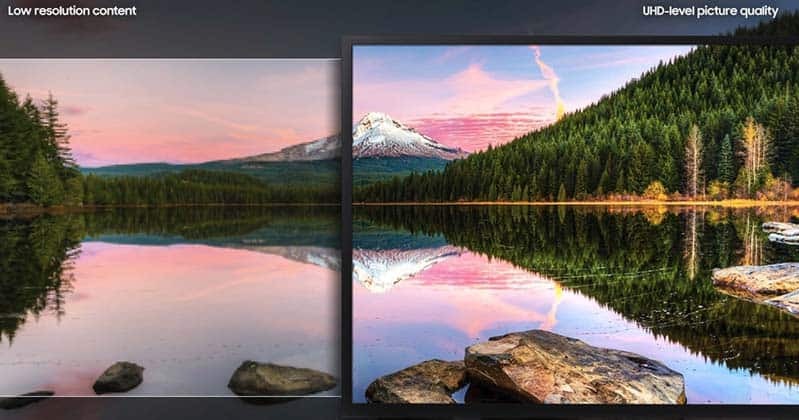 Regardless, the Samsung U32J590 monitor offers an excellent image quality for the price thanks to its 4K UHD resolution, high contrast, decent 270-nit peak brightness, and 10-bit color support (1.07 billion colors with 8-bit + 2-bit dithering). It also provides you with wide 178-degree viewing angles and a high-quality upscaling capability. Moving on, the Samsung U32J590 input lag performance is excellent with only 10ms of imperceptible delay. The response time (pixel transition speed) is not as good. In fast-paced games, there’s some visible trailing behind fast-moving objects which is particularly noticeable in darker scenes. While it’s not game-breaking, we advise you to consider an IPS or TN display instead if you mainly play competitive first-person shooters. 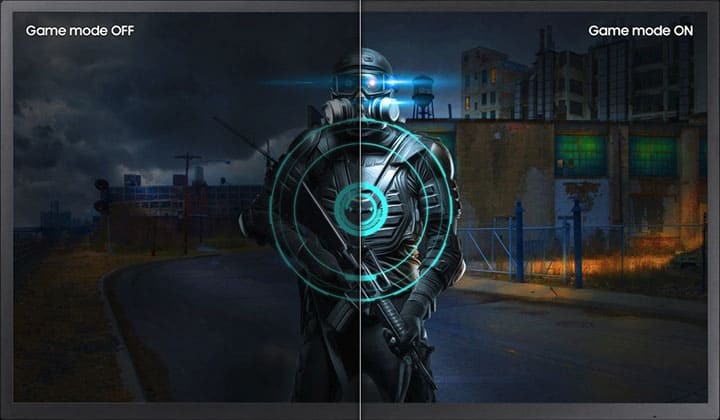 In case you’re not a competitive gamer, the VA panel of the Samsung U32J590 32″ monitor does offer the best contrast ratio in comparison to IPS and TN panels which will provide you with better visuals and more visible details in shadows and highlights of the picture. Note that the Samsung U32J590 display uses PWM (Pulse-Width Modulation) to regulate brightness at lower backlight settings. 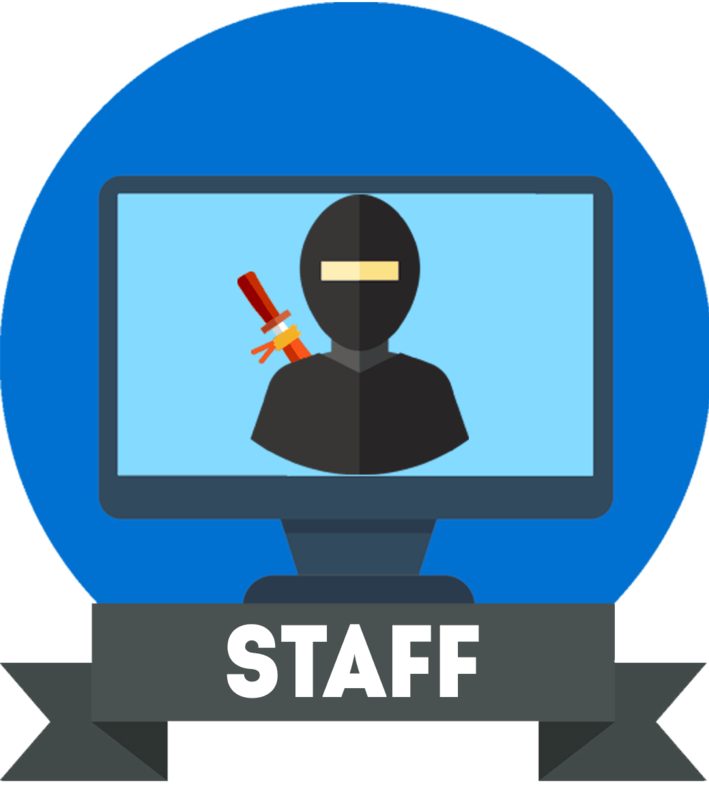 So, if you are sensitive to screen flicker, reducing the monitor’s brightness too much may cause you headaches or eye strain. In addition to standard adjustments such as brightness/contrast, color temperature, input selection, etc, the Samsung U32J590 features Picture in Picture and Picture by Picture as well as the Game mode which alters the gamma curvature for better visibility in dark areas of games. AMD FreeSync is supported as well which means that by connecting a compatible AMD graphics card or an Xbox One/S/X console to the monitor, you get a variable refresh rate (VRR). This removes all screen tearing and stuttering as long as your FPS (Frames Per Second) rate stays within the 40-60Hz/FPS range if you select ‘Ulitmate Engine’ or 50-60Hz if you select ‘Standard Engine’. FreeSync works over both DisplayPort and HDMI on this monitor. Note that the Samsung U32J590 is not G-SYNC compatible and doesn’t provide a variable refresh rate for NVIDIA cards. While the monitor has a tilt-only design, it’s rather slim, has thin bezels, and VESA mount compatibility. At the back of the monitor, you will find the following ports: an HDMI 1.4 (max 30Hz at 4K), an HDMI 2.0 (4K 60Hz), a DisplayPort 1.2 (4K 60Hz), and a headphones jack. HDCP 2.2 is supported, so you can watch copy-protected content in 4K UHD from streaming services such as Netflix on the Samsung U32J590 as well. 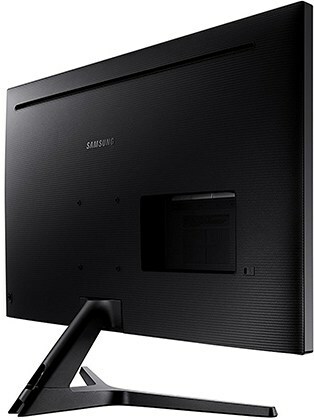 The Samsung U32J590 price ranges from $370 to $400. 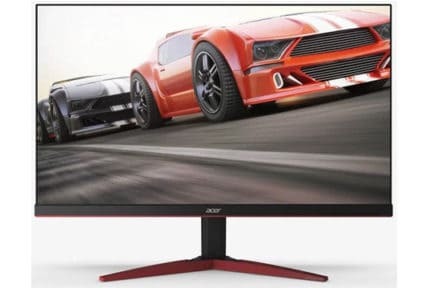 Along with the Acer ET322QK, it’s one of the cheapest 4K UHD monitors. While the Acer ET322QK offers HDR support, it also has a notably higher input lag. Moreover, its HDR support is software-enabled only, so, you just get over-saturated colors for HDR content. 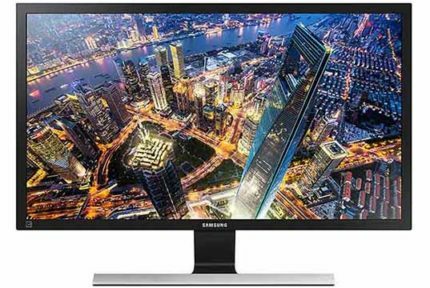 Therefore, we recommend the Samsung U32J590 as the best budget 4K monitor. For more information, visit our buying guides for the best 4K monitors for Xbox One X and PS4 Pro and the best 4K TVs for Xbox One X and PS4 Pro. Overall, the Samsung U32J590 is a great 4K monitor for home entertainment. Thanks to its low input lag, decent response time, and AMD FreeSync, it’s perfect for console and PC gaming, especially if you have an Xbox One or an AMD GPU. Additionally, its high contrast, high resolution, and rich colors make movies more immersive and enjoyable and it’s even excellent for some basic non-color-critical content creation and office-related work. The Samsung U32J590 is the best budget monitor for 4K PC gaming, console gaming, and overall multimedia enjoyment.